Cloud Based Integration Platform as a Service is from MuleSoft. MuleSoft is an Open Source Project, the name was taken to insult closed source donkey works started back in 2003 by Ross Mason. From Nokia to DHL, many well established brands uses MuleSoft’s Open Source Enterprise Service Bus (ESB). Integration Platform as a Service (iPaaS) is a brain child of MuleSoft. 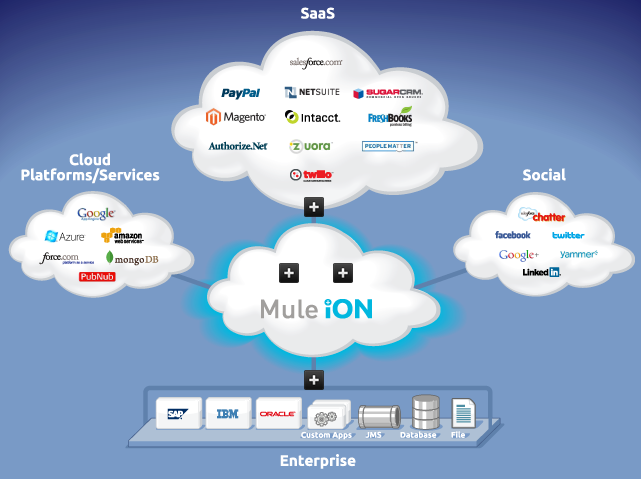 MuleSoft brands Cloud Based Integration Platform as a Service (iPaaS) as Mule iON. In this article, we will discuss what is this Cloud Based Integration Platform as a Service (iPaaS) and what Cloud Based Integration Platform as a Service can offer. We have already written about Platform as a Service (PaaS) and Software as a Service (SaaS). Elementary knowledge is needed to understand what is this Cloud Based Integration Platform as a Service (iPaaS). Cloud Based Integration Platform as a Service (iPaaS) or rather Mule iON is a cloud based integration platform built on leading Mule integration technology in the core which enables the developers to integrate and applications and services seamlessly across different clouds. From the above diagram (from MuleSoft) it is quite easily understandable the basic mechanism of Cloud Based Integration Platform as a Service (or Mule iON). As officially written – Mule iON is a cloud based integration platform as a service (iPaaS) that enables developers to create simple packaged integration applications (iApps), to solve common cloud-to-cloud and cloud-to-premise integration problems. Mule iON is the easiest way for SaaS providers and integrators to solve the integration problem, knocking down the barriers for new customer adoption. Mule iON, the Cloud Based Integration Platform as a Service from Mule Soft is based on software infrastructure of Apache Tomcat application server. This Article Has Been Shared 3220 Times! Outsourcing in Public Cloud demands strategies for proper execution in to reality. It starts with the Planning Phase and ends with a controlled termination. Installing Apache Subversion Plus Trac on Rackspace Cloud Server requires some advanced commands. This is for Ubuntu build as you can add managed level later. We absolutely love your blog and find nearly all of your post’s to be just what I’m looking for. can you offer guest writers to write content for you? I wouldn’t mind producing a post or elaborating on most of the subjects you write about here. Again, awesome website! Guest Writing – Depends on degree, reputation etc. parameters of the person. Cite this article as: Abhishek Ghosh, "Cloud Based Integration Platform as a Service (iPaaS) and MuleSoft," in The Customize Windows, October 25, 2011, April 25, 2019, https://thecustomizewindows.com/2011/10/cloud-based-integration-platform-as-a-service-ipaas-and-mulesoft/.